The European Union is often accused of acting undemocratically, but this complaint is not always backed up with concrete examples. This is probably the EUs’ most flagrant violation of democratic principles to date, and one of the most hated acronyms of the past decade – ACTA, the Anti-Counterfeiting Trade Agreement. The EU’s PR machine sold ACTA as being an international trade agreement that aimed to establish multinational standards on intellectual property rights enforcement. Put that way, it sounds rather hard to disagree with. It didn’t take much digging below the surface, though, to find out what was really behind the Trade Agreement and just how it could affect ordinary people. If you went by the title alone, you’d think the agreement was all about stopping the counterfeiting of goods – especially medicines, watches, luggage and the like. In reality, it was drafted to have a much broader scope, that could include censorship of the world wide web. None of this was clear to people at the time because – just like TTIP – it was negotiated in secret. Many countries signed up to it including Canada, Japan, Korea, Morocco, New Zealand, Singapore and the US. In typical slimy, secretive EU fashion, ACTA was slipped through a European Council meeting devoted to agriculture and fisheries. It reached the stage of being signed by officials of the EU before the European Parliament had a chance to vote on it. (This by the way is perfectly permissible under the EU’s constitution and quite a normal way of doing its shady deals that it doesn’t want us to know about, just like TTIP). It was at this point that people started to rumble what ACTA was really about. ACTA was negotiated as a trade agreement, which the EU has sole power to handle and this gave it freedom from democratic scrutiny. In reality it was copyright legislation being pushed through under the guise of a trade agreement so that it didn’t get debated. And unlike any other trade agreement, it contained criminal sanctions. Usually, the EU can negotiate Trade Agreements without any reference to member countries. But because this “trade agreement” contained criminal penalties for infringing copyrights and even “aiding and abetting” infringement of copyrights, the EU was compelled to bring in the member countries. They still negotiated these new criminal sanctions behind closed doors, but it was now that the real nature of the law leaked. The nature of criminal sanctions is up to the signatories, but it meant prison and large fines for anyone found guilty of copyright piracy on a “commercial scale”. This could mean any website found to be hosting pirated content that has a large audience or even those people deemed to be “aiding and abetting” copyright infringement, which could extend to ISPs. Maybe even Google. Maybe even bloggers. 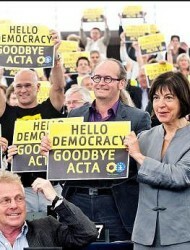 People all over Europe were outraged when they found out what ACTA was really about. Online activists paralysed some of Poland’s government websites to protest against Warsaw’s plans to sign the treaty, fearing it meant censorship on the web. The hackers of Anonymous announced over Twitter that they were planning a “huge operation soon” opposing ACTA. There were street demonstrations across European cities and five petitions against the treaty, one of which gained 2.8 million signatures. It’s easier to see what ACTA is really about when you see who supported it: GlaxoSmithKline, Pfizer, Sanofi-Aventis, Monsanto Company, Time Warner, Sony, Verizon, The Walt Disney Company, the Motion Picture Association of America, News Corporation, and Viacom. The European Commission supported it because it was wanted by its friends in big business. Once the cat was out of the bag however, the European Parliament came out unanimously against it, and even demonstrated in the chamber. Once it was busted in the full glare of publicity, the EU Commission had no choice but to perform a reverse ferret. But it did learn from the affair. All kinds of Draconian and anti-democratic measures can be enacted without reference to Parliament or people, as long as they are buried in a Trade Treaty, which it alone has the power to enact. And – the most crucial lesson of all – the terms of the treaty must be kept secret from prying eyes, from journalists and, most important of all, from the citizens of the EU who might oppose it. The EU is determined that TTIP will remain secret and it is determined to push it through despite all opposition from Parliament and people. Hence the ludicrous restrictions on even MEPs, having to sign their lives away to gain access to a secret room where they are not even allowed to take verbatim notes. Luckily for the rest of us, Greenpeace was able to obtain copies of part of the treaty and blow the whistle on it, thus torpedeoing the EU’s latest attempt to sell its citizens down the river in the interests of its big business friends. But please don’t breathe a sigh of relief just yet. One thing is certain, even if the EU Commission is defeated over TTIP, it will be back again, and again and again with ever more undemocratic deceptions and con tricks and, eventually, some of them will get through. When that happens it will automatically become the law of the UK and it then will be too late to complain or try to oppose them. Was John Maynard Keynes really the Warren Buffet of his day? This adds some interesting facts to go alongside the fantasy described here. Thanks for the link Clive. I’ve filed it under the heading of “They would say that wouldn’t they?” as it’s an EU publication, paid for with our cash, written for PR purposes. Perhaps you could refer me to the EU document which tells us about the transparency of EU negotiations for TTIP? Possibly the same link where it states that “the current negotiations with the US have had 3 public consultations in one year alone”? If you are going to write off every piece of documentation that has any bias to it, then everything that you have written, every piece that you have linked to and every conclusion you have drawn is surely suspect as well? The EU is the right group to write about what the EU’s processes are. If you believe that it has acted against them, then by law under the Treaty of Rome you have the full right to petition the Parliament and Council for a hearing. This, if found to warrant further investigation (and you are first and foremost in being able to dig out incontrovertible evidence), you will be called to,present it in front of Parliament, and if necessary in front of the European Court of Justice. it’s all there – if you really believe these conspiracy theories you are putting forward, put your money where your mouth is. Get a load of your journalist friends to work alongside you to make sure that the Great Conspiracy of all the EU institutions cannot hide any of your evidence; make sure that it is all fully documented; make sure that the journalists are with you when you stand up in front of Parliament and present your rock-solid case. If you win, I will totally recant; will apologise in full in any way that you want; will pay a sizeable sum to any charity of your choice. Am I offering enough for you to take this on, and for once and all, sort out this mob that you have such sincere beliefs about as to how they are only out to do in the EU (or possibly only the UK, or just Richard Milton) citizen through legal proof, rather than conjecture, misreading and misrepresentation of facts and misuse and misrepresentation of data? You say: “Possibly the same link where it states that “the current negotiations with the US have had 3 public consultations in one year alone”? Clive, If TTIP is transparent as you claim what is your explanation of this incident? You say:“it’s all there – if you really believe these conspiracy theories you are putting forward, put your money where your mouth is. Get a load of your journalist friends to work alongside you to make sure that the Great Conspiracy of all the EU institutions cannot hide any of your evidence; make sure that it is all fully documented; make sure that the journalists are with you when you stand up in front of Parliament and present your rock-solid case. If you’d troubled to read my blogs before posting this challenge you would have already learned the answers to all the questions you ask. 1998, Paul van Buitenen. Assistant internal auditor in the EU’s Financial Control Directorate, turned whistleblower and wrote directly to the European Parliament expressing his “. . . discontent with the way the Commission services are dealing with irregularities and possible fraud.” He was suspended and his salary halved. 2002, Marta Andreason. EU Chief Accountant. Refused to sign the accounts. Complained to the Commission, was ignored. Sacked for “failure to show sufficient loyalty and respect”. 2002, Dorte Schmidt-Brown worked at the EU’s statistics agency Eurostat for nine years and became concerned by a number of dubious studies, reporting her suspicions to her superiors. She was transferred to another department. When she continued to speak out she was sent on sick leave. A subsequent investigation into Eurostat revealed what the investigators called a ‘vast enterprise of looting’, in which senior employees had diverted millions of euros into companies owned by friends, family and others. 2003, Robert McCoy had worked at the EU for more than 30 years and had risen to the post of Internal Auditor at the Committee of the Regions . McCoy was concerned about what seemed to be the systematic abuse of travel expenses by CoR members, including claims for meetings that didn’t take place, for car journeys already paid by members’ towns and councils and for train and air travel that had already been reimbursed. McCoy asked the committee’s secretary general to pass on the suspicious expenses claims to OLAF for investigation but his request was refused. When McCoy went public with his concerns, OLAF and the Court of Auditors were eventually called in to investigate. OLAF investigators concluded, ‘The investigation revealed systematic and flagrant incompetence within the Committee of the Regions to respect the essential rules of tendering procedures and financial management.’ Even though McCoy’s allegations were correct, he was hounded, insulted and bullied until he left on sick leave. No action was taken against the committee members who had allegedly stolen money. What chance would an outsider like you or me stand? Incidentally, I am not asking you to apologize, recant or contribute to a charity. I’m just asking you to look at the facts and make up your own mind who is telling the truth: the EU or the people listed above.